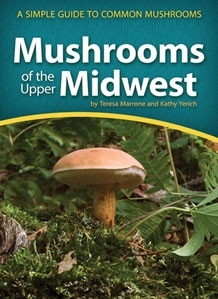 This is a small (roughly 4.5 x 6 inches) guide that, as the title states, deals with mushrooms commonly encountered in the upper Midwest (the Dakotas, Illinois, Indiana, Iowa, Michigan, Minnesota, and Wisconsin). It "was written with the beginning mushroom enthusiast in mind." The publisher's notes suggest that nearly 400 species are covered but that number must include pretty much every species mentioned anywhere, as the number of well described and illustrated species is much smaller. Nearly all the species also occur widely outside the subject area and most are covered in many other books. Both authors are long-time foragers for wild foods. Teresa Marrone has written a number of outdoor-themed books as well as cookbooks featuring wild foods. She lives in Minneapolis. Kathy Yerich, who lives in Forest Lake, Minnesota, is a member of the Minnesota Mycological Society. Both contributed photographs to the project. The introductory material is brief, comprising only about 15 pages. It includes the rationale behind the book, an explanation of what mushrooms are and how to look at them, cautions for eating them, and a bit of basic fungus biology. This is followed by an explanation of how best to use the book, a description of the ten morphological groups (cap and stem with gills, cap and stem with pores, coral and club fungi, etc.) used to organize one section of the book, and the species accounts. A list of books and websites, glossary, and index follow the species treatments. The species accounts occupy 242 pages, broken down into three main sections—"top edibles," "top toxics," and "mushrooms grouped by type." Other than the description of the morphological types, there are no keys or other identification aids. The reader is directed to look for picture matches, starting with the morphological groups. Unfortunately, separating out the main edible and poisonous species makes the user have to look in three different sections of the book before deciding whether (s)he has found a match for the mushrooms in hand. Within the morphological groups, the species are organized by color, proceeding from light to dark, which leads to juxtapositions such as an agaricus following a lactarius, which is confusing for someone with some experience and makes it hard for a beginner to begin developing a feel for the Friesian genera that form the basic framework for learning mushroom identification. The "species" accounts include a number of groups, such as morels, toxic boletes, and earthstars, in addition to descriptions of single species. The content of the entries varies. The headings are all common names, with the scientific names in a much smaller font beneath them. Information categories include Habitat, Description, Spore print, Season, Other names, Compare, and Notes although, for many species, not all are included. The page edges are color-coded to facilitate finding the edibles (green), toxics (red), and morphotype (ten different colors) sections. The pages also include several icons for those same groupings, plus habitat and fruiting season. I didn't find the icons useful as they merely repeat information in the descriptions and also include adjacent tiny-font text explaining their meanings. The more important features of the fungus are highlighted in the text through use of a colored boldface font. The photographs vary in size from nearly a whole page down to roughly one-eighth of a page. They are generally of very good quality and most show the key features well. While reading the book, I encountered a few things that puzzled me. A tiny handful of slime molds is included. They aren't mushrooms and, even though some are included in several other books, presenting a handful isn't going to be all that helpful to someone interested in these organisms. Better to have devoted the pages to more mushrooms. More than once, the authors emphasize the value of scientific names and the limitations of common names but they then use common names, rather than scientific ones, in the main headings, photo captions, and text. Perhaps few users would read the book from cover to cover but, in my doing so, it got very annoying to read over and over and over again that "this species is mycorrhizal, growing in symbiotic association with living trees" and "they are saprobes, getting nutrients from dead organic matter." The mushroom lifestyle terms are explained in the introduction and they are included in the glossary so there is no need to explain them nearly every time they are used in the descriptions. The information presented generally is accurate. However, there are a few glitches. One of the photos representing Laccaria laccata shows a large number of mushrooms fruiting amongst wood chips, not a typical habitat for that species. They are probably tubarias. Gomphus clavatus is not closely related to chanterelles, even though it is similar-looking, and no one I have ever asked considers it a choice edible. Omphalotus illudens, the jack o' lantern of eastern North America, is said to have caused deaths. If so, that is news to me and those knowledgeable fellows on NAMA's Toxicology Committee. Ditto for Coprinellus micaceus, the mica cap, causing the "Antabuse" reaction. Chaga is not the only black clinker—Phellinus tremulae produces similar growths on aspens. Crust fungi are not all saprotrophs, many of them are ectomycorrhizal. Several of the glossary definitions are either incorrect (e.g., "fungus", the examples given for "marginate," "volva," and "white rot") or not very clear (e.g., those for "genus" and "kingdom"). Nevertheless, this is not a bad little book. It isn't very expensive and using it might help a beginner decide whether mushrooms are something worth learning more about. However, I'm skeptical about how well it will help people start learning to identify mushrooms. I fear that not grouping the species by the traditional Friesian genera will prevent the newcomers from beginning to develop a feel for what, for example, an amanita, russula, or cortinarius is, and that is an essential first step in becoming skilled at mushroom identification. 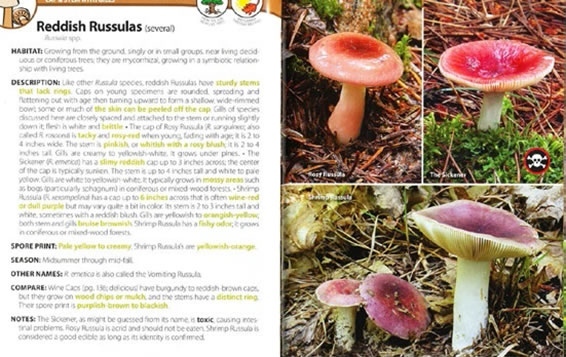 As for mushroomers with some experience (remembering that this is not the book's target audience), nearly all the species can be found in many other field guides, so adding this to an existing library would probably not increase one's ability to identify many things. However, if your library is still small, this could be a handy addition. This review was published in the January-February 2015 issue of The Mycophile.